Although potentially lucrative, the Newfoundland and Labrador spring sealing industry was also more hazardous than any other local fishery at the turn of the 20th century. To find their catch, sealing ships had to steam each year into the dangerous ice floes off Newfoundland’s north coast, where large frozen masses of floating seawater and sudden blizzards could jam ships in the ice and crush their hulls. Five steamers were lost between 1906 and 1914, reducing the country’s sealing fleet to 20 vessels. In no other fishery did ships enter the floes. 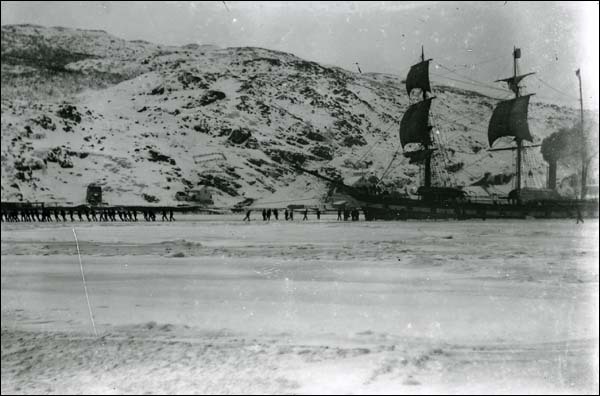 The wooden sealing vessel SS Newfoundland left St. John’s for the North Atlantic ice floes in March 1914. Photographer unknown. Reproduced by permission of Archives and Special Collections (Coll. 115 16.04.099), Queen Elizabeth II Library, Memorial University of Newfoundland, St. John's, NL. Once on the ice, the men faced additional dangers. Carrying little food, no shelter, and dressed in clothing ill-suited for sudden squalls, the sealers might spend up to 12 consecutive hours on the ice. Because their ships could only maneuver a limited distance into the ice fields, the men often had to walk for miles before reaching any seals. If the unpredictable North Atlantic weather worsened, the men would have to turn back and fight their way through blinding snow and fierce winds, guided to safety by the sound of their ship’s whistle. Although quick to help, captains of other vessels often did not know when crews other than their own were in trouble because of the great distances separating ships. While the sealing fleet had encompassed upwards of 400 sailing ships in the early 1800s, the introduction of giant steamers with their large crews in the late 19th century had thinned the fleet considerably and forced vessels to be more widely spaced throughout the ice floes. Some ships carried wireless apparatus to aid in communication, but the costly equipment was not mandatory and often considered unnecessary by ship-owners. Inevitably, the dangers inherent to the Newfoundland and Labrador seal fishery – augmented by human error or negligence – resulted in numerous deaths and accidents. The most horrific of these occurred in 1914, when 251 of the country’s sealers died in two separate but simultaneous disasters involving the SS Newfoundland and SS Southern Cross. These tragedies were immediately seared into the public consciousness and ultimately prompted government officials to change the way they regulated the seal fishery. Although the Newfoundland disaster resulted in fewer deaths than that of the Southern Cross, its shocking details sparked a more intense and emotional response from the public. For two days, 132 sealers were stranded on the ice in blizzard conditions and without adequate shelter. More than two-thirds of the men died and many of the survivors lost one or more limbs to frostbite. Thomas Dawson of the SS Newfoundland arrives at the port of St. John’s after being stranded on the North Atlantic ice floes. Photographer unknown. Reproduced by permission of Archives and Special Collections (Coll. 115 16.04.048), Queen Elizabeth II Library, Memorial University of Newfoundland, St. John's, NL. However, when the SS Newfoundland left St. John’s for the North Atlantic ice fields in March 1914, no one anticipated the hardships that lay ahead. Its captain, Westbury Kean, was accompanied on the hunt that year by his father Abram Kean, veteran sealer and captain of the SS Stephano. Although the two ships worked for competing firms, each captain had agreed to alert the other of any seals they spotted by raising their after derrick – a type of wooden crane found on marine vessels. On March 30, the powerful steel steamer Stephano had navigated its way deep into the ice fields where it found a herd of seals. Abram Kean ordered his derrick raised, but the Newfoundland – a weaker and less maneuverable wooden steamer – was jammed in the ice between five and seven miles to the south and could not proceed. Frustrated by his inability to move and anxious to catch a share of the seal herd, Westbury Kean ordered his men off the ship the following morning. He instructed them to walk to the Stephano, believing the sealers would spend the night onboard his father’s steamer after a day of hunting. Although the sky was cloudy, Kean did not anticipate bad weather as the morning was mild and the ship’s barometer gave no indication of a brewing storm. The Newfoundland, however, was not carrying a thermometer and Kean could not tell if the temperature was falling or rising. Nonetheless, 166 men jumped onto the ice and headed for the distant Stephano at 7 a.m. As the morning progressed, many of the sealers recognized signs of an approaching storm and talked uneasily about the weather. At about 10 o'clock, 34 men decided to turn back; the remaining 132 reached the Stephano by 11:30. Abram Kean invited the men on board and offered them a lunch of tea and hard bread. He mistakenly believed that the group had left the Newfoundland at 9 a.m. and had only been walking for two hours. While the men ate, Kean navigated the Stephano towards a group of seals two miles to the south. Although it was snowing quite hard, Kean ordered the men off his ship at 11:50, with instructions to kill 1,500 seals before returning to the Newfoundland. He did not invite them onto the Stephano for the night. George Tuff, Second Hand of the SS Newfoundland, n.d.
Second hand of the SS Newfoundland, George Tuff was also the officer in charge of the 132 sealers stranded on the ice between March 31 and April 2, 1914. Photographer unknown. Reproduced by permission of Archives and Special Collections (Coll. 115 16.04.032), Queen Elizabeth II Library, Memorial University of Newfoundland, St. John's, NL. Tired from the morning's four-hour trek, unable to see the Newfoundland, and in a thickening storm, the 132 men were once again on the ice. The group's leader, George Tuff, did not object to Kean's orders and the Stephano steamed away to pick up its own crewmembers hunting in the north. By 12:45 the blowing snow forced the sealers to stop hunting and head for their own ship. Walking through knee-deep snowdrifts and across wheeling ice pans, the men continued until dark, when Tuff ordered them to build shelters from loose chunks of ice. This, however, proved ineffectual against the night’s shifting winds, sudden ice storms, and plummeting temperatures. Many men died before morning; others could barely walk, their limbs frozen and numb. The group spent the next day and night trying to reach the Newfoundland, but without luck. Some men, delirious, walked into the frigid waters and drowned; others were pulled back onto the ice by their companions, but often died within minutes. Westbury and Abram Kean, meanwhile, each believed the sealers were safely aboard the other man’s ship. Communication between the two vessels was impossible because the Newfoundland was not carrying wireless equipment. The steamer’s owner, A.J. Harvey and Company, had removed the ship’s wireless because it had failed to result in larger catches during previous seasons. The firm was interested in the radio only as a means of improving the hunt’s profitability and did not view it as a safety device. 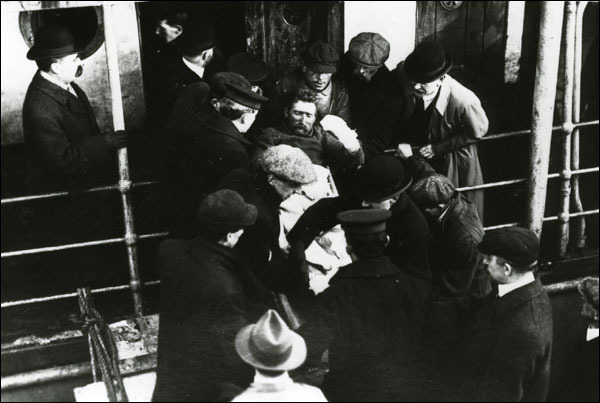 Rescuers from the SS Bellaventure carry dead and injured sealers from the SS Newfoundland on stretchers. Photographer unknown. Reproduced by permission of Archives and Special Collections (Coll. 115 16.04.038), Queen Elizabeth II Library, Memorial University of Newfoundland, St. John's, NL. It was not until the morning of April 2 that Westbury Kean, surveying the floes through his binoculars, spotted his men crawling and staggering across the ice. Desperate to help, but lacking any flares, Kean improvised a distress signal to alert other vessels within the fleet. Soon, crewmen from the SS Bellaventure were on the ice with blankets, food, and drink. The Stephano and SS Florizel also helped in the search. Of the 77 men who died on the ice, rescuers found only 69 bodies; the remaining eight had likely fallen into the water. 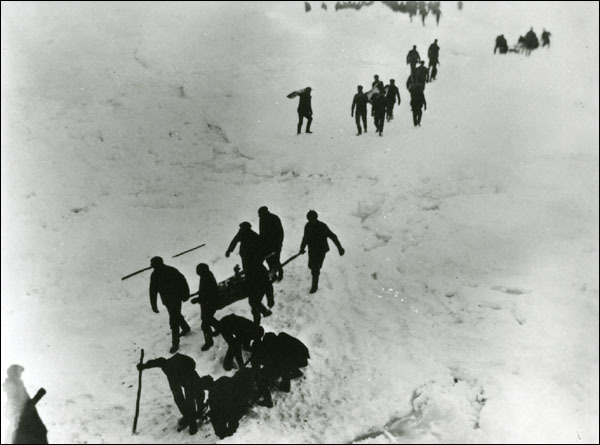 The survivors were brought to St. John’s for medical care, where another man, John Keels, also died from his ordeal on the ice. While the 132 men of the Newfoundland were stranded on the ice in the North Atlantic, a second sealing tragedy was unfolding to the south. 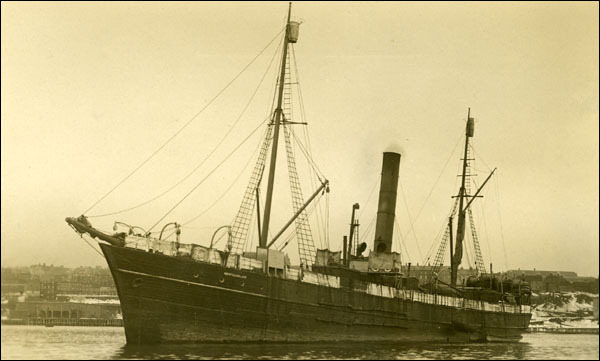 In late March or early April 1914, the SS Southern Cross sank while returning to Newfoundland from the Gulf of St. Lawrence, taking with it 173 men. In late March or early April 1914, the SS Southern Cross sank while returning to Newfoundland from the Gulf of St. Lawrence. In this photograph, the sealing vessel is jammed in the ice in St. John's harbour and its crew is trying to pull it free. Photographer unknown. Reproduced by permission of Archives and Special Collections (Coll. 115 16.04.003), Queen Elizabeth II Library, Memorial University of Newfoundland, St. John's, NL. On March 31, the coastal steamer SS Portia passed the Southern Cross near Cape Pine, off the southern Avalon Peninsula. Although the Portia was headed for St. Mary’s Bay to wait out a worsening blizzard, the Southern Cross, low in the water with its large cargo of seal pelts, seemed headed for Cape Race. The steamer was not seen again, and because no wireless equipment was on board, communication with other vessels was impossible. However, popular consensus at the time suggested that the ship’s heavy cargo may have shifted suddenly in the stormy waves and capsized the steamer. In his book The Ice Hunters, Shannon Ryan also suggests that the ship’s captain, George Clarke, may have pressed through the storm because he was anxious for the recognition and the small prize traditionally awarded to the first arrival back from the seal hunt. Whatever the cause, the sinking of the Southern Cross resulted in more deaths than any other single disaster in Newfoundland and Labrador sealing history. In 1915, the government held a commission of enquiry to examine the Newfoundland and Southern Cross sealing disasters. Although it laid no criminal charges, the enquiry found Abram Kean, Westbury Kean, and George Tuff all guilty of errors in judgment. 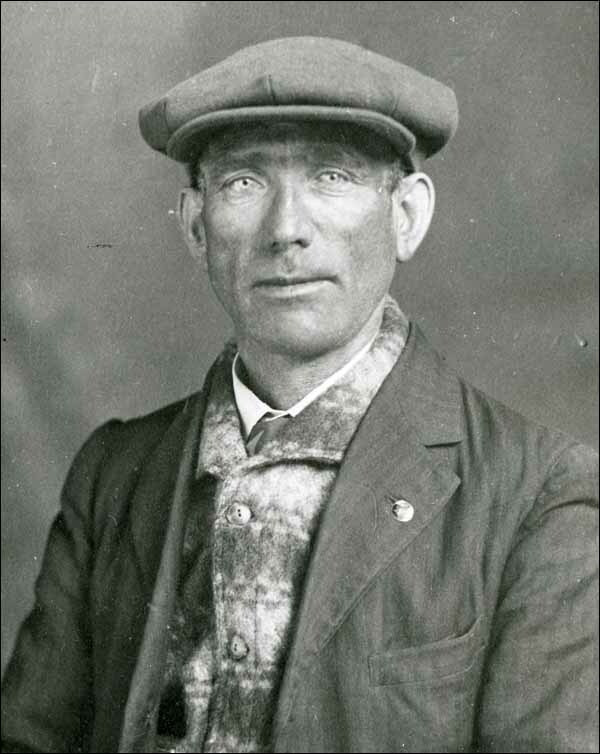 In Tuff’s case, the enquiry felt he should have refused the orders of Abram Kean, one of the most powerful men in the seal hunt, to return with his watch to the Newfoundland. More importantly, the commission recommended that all sealing vessels carry wireless sets, barometers, and thermometers, and that ship owners be held accountable for any injuries or deaths sustained by their crews. In 1916, the government passed legislation prohibiting sealers from being on the ice after dark and requiring all sealing ships to carry wireless equipment and flares. In response to theories that the Southern Cross sank because of overloading, the government also made it illegal for any ship to return from the hunt with more that 35,000 pelts. For other related articles view the Disasters section of the Government and Politics Table of Contents.